Washington (CNN) – Tim Kaine, the Democratic candidate for U.S. Senate in Virginia, said Thursday during a debate that he could support a minimum tax for all Americans, no matter their income level or job status. Kaine, who is the former governor of Virginia and chairman of the Democratic National Committee, was answering a question related to recently revealed comments from GOP presidential nominee Mitt Romney, who was captured on secretly recorded tapes saying the 47% of Americans on government programs consider themselves "victims." Kaine, while objecting to Romney's sentiments and what he called the divisive nature of the comments, said he would consider asking every American to contribute a minimum amount in taxes. "I would be open to a proposal that would have some minimum for everyone," Kaine said. "But I do insist, many of the 47% that Gov. Romney was going after pay a higher percentage of their income in taxes than he does." 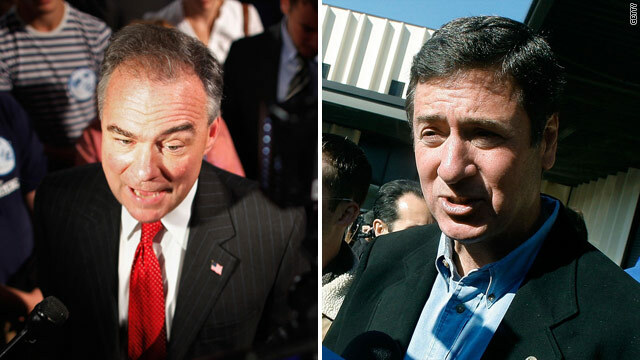 Kaine's rival, former Sen. George Allen, wouldn't say whether he backed Romney's comments about dependency, saying he has his "own point of view." "I think that's one of the attributes of all Americans, they don't look at themselves as victims," Allen, who has also served as Virginia's governor, said during the debate. "They want a government that reflects their values and gives them an opportunity to reach their aspirations." Thursday's debate focused largely on the so-called "fiscal cliff" – a package of sweeping spending cuts and tax increases that would go into effect in January unless Congress reaches a deal on reducing the federal deficit. Members have thus far been unable to strike a deal using more targeted cuts. The cuts include a massive slashing of the defense budget, an issue that would drastically effect Virginia's population of service members, as well as the large defense contractors that have their headquarters in the Commonwealth. Kaine cited his plan to reduce the deficit to manageable levels by, among other things, letting Bush-era tax cuts expire for Americans earning more than $500,000 annually. He also characterized his rival as a pro-spending Republican who only recently assumed the mantle of a fiscal conservative. "He was a senator for six years. During his time in the Senate his fiscal policies turned massive surpluses into massive deficits," Kaine said. The Democratic candidate continued, "Now he's talking like a fiscal conservative, but his record as a senator shows we can't afford to let him have another crack at it because his actions don't match his words." Allen said Kaine and other Democrats were playing politics with service members' job security, using them as "political pawns" to justify tax increases. "It is so dangerous and so wrong to be playing these political games with our armed services," Allen said. "We need to be strong. We need to have a strong economy to have a strong national defense, and the last thing we ought to be doing is to have these devastating cuts to our military readiness." In July, Kaine and Allen faced off at a debate moderated by CNN Chief Political Correspondent Candy Crowley, touching on similar issues but also addressing whether or not background checks should be required for people purchasing firearms at gun shows. Both candidates agreed that background checks should be a necessary prerequisite for purchasing a gun, though Allen added that the solution to gun violence shouldn't be "to take away the rights of law-abiding citizens to protect themselves or their families." The latest polling in Virginia's Senate race shows Kaine with a slight lead over Allen. A Washington Post survey taken September 12-16 showed Kaine with the support of 51% of likely Virginia voters, compared to 43% for Allen. And a Quinnipiac University/New York Times/CBS poll released this week showed Kaine at 51% and Allen at 44%. How does Willard poll with Puerto Ricans, Dominicans and Mexicans? Not well because they are government dependent, these people like big government." And there we have it, folks. THE GOP/TEATROLL AND MITTENS IN A NUTSHELL: "IF YOU'RE BROWN, GET OUT OF MY TOWN." This race is a big deal. Mr. Macaca is down by 7 points in the polls and it's going to get alot worst after Willard's 47% comments. Allen needs to go to the zoo and find some monkeys to make fun of. He is too easy to make fun of. Ask these republicans including Allen who advocates a larger,stronger military here and globally if they themselves ever served,only about 30% of these chicken hawks ever served,its fact.Democrates the diplomatic ones had a 70% involvement in all military branches,most served in Vietnam or earlier conflicts,many are declorated vets that turned to public service after their military time was up.They express a more leaner,meaner military presence but smaller and also more diplomatic as said before,use your brain instead of your brawn in resolving conflicts globally,its easier and usually less expensive in hardware and lives lost..Plus you get more respect from foriegn nations being more civilized being diplomatic instead of starting wars...Remember people who usually gets us in military conflicts or wars,historicly republicans,they most certainly like Cheney profit from war,that's a fact that republicans seem to cherish!!! Surely Virginia voters have more sense than sending George Allen back to the Senate. His first time there was a total disaster ... spending like a drunken sailor in D.C., turning a hard-fought budget surplus into a huge deficit. Tim Kaine, the Democratic candidate for U.S. Senate in Virginia, said Thursday during a debate that he could support a minimum tax for all Americans, no matter their income level or job status. First SANE thing I have heard a Democrat say in years. He must be going light on the koolaide today. It is fine for everyone to pay something. It is the question of those that have the most not doing anything with what they have and not chipping into what needs to get done. More often than not the poor serve more in the military. Let the wealthy pay for the military; plane, tanks, etc. That could be something. Those leads mentioning the percentages are not "slight". What he said was that he would CONSIDER supporting it, depending on the details. In other words, he is interested in keeping an open mind, something you would know nothing about.